The Fritzler Corn Maze is one of the original corn mazes in Colorado, and a staple of northern Colorado every fall. 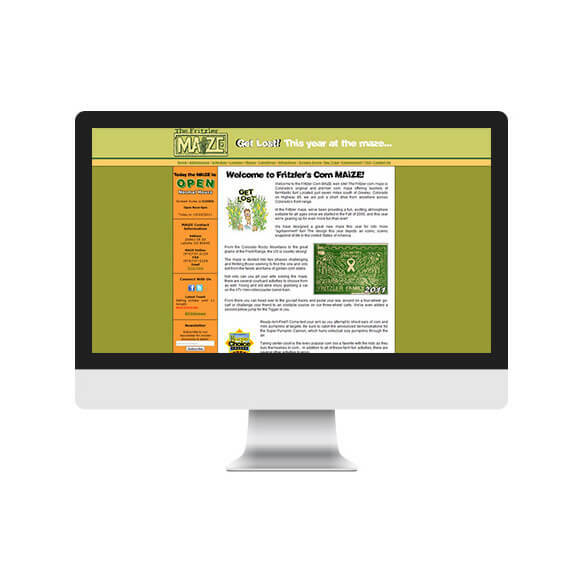 They are also one of our oldest clients, as they approached us back in 2003 to design an informational website for their maze to attract online visitors to their physical maze. #1 placement in Google organic search. Open/Closed widget that shows whether or not the maze is open, as well as hours or any other special information. Completely autonomous – the sign changes based on the open/closed schedule for the current season of the maze. The widget can be updated, on-the-fly, by the Fritzlers – such as in the case of inclement weather – to let patrons know if they are open, closed, or have special hours. Newsletter sign-up – integrated with MailChimp.